← Day 354.2 – too hot needed to change! This gorgeous Esprit skirt always gets lots of Christmas action here in Brisbane where it can be about 35 degrees this time of year. And I love to wear it with this hot pink Top Shop T because there is a bush here that comes out at Christmas time called the Lillipilly and it has glossy green leaves, pink leaves and pink berries. This combo reminds me of it. 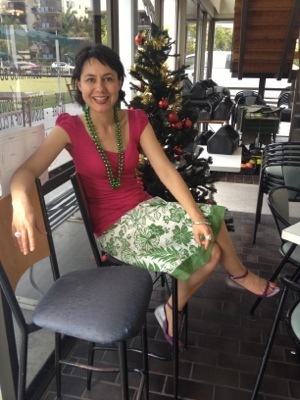 Posted in Esprit, fashion, work and tagged Australia, Australian Christmas, Christmas, Lillipilly. Bookmark the permalink. Love, Love the skirt! the entire out, fabulous. Well put together darling. I found you via “As Time Goes By” Happy Holidays! Thank you Maylana 🙂 As Time Goes…Buy and I linked earlier in the year when she was doing her 90 days if no shopping … I’m still going but just 10 days left. Thank you for stopping by and following Fashion Mashie. I hope I can make the last 10 days great for you! Thank you for your lovely response. Let’s make the last 10 days the best yet!